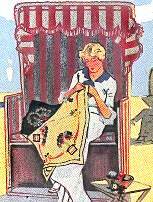 Art Nouveau and Modern Style seat History and Needlepoint Tapestries designs from Museum. The curvilinear lines of Hector Guimard (1867-1942), became synonymous with the Art Nouveau movement. Extract from advertising materials by Fritz Rumpf used in embroidery for the summer holidays, about 1914. Curt Behrends, Berlin Extract from poster by Alfons Maria Mucha (czech) - Paris, F. Champenois, 1898. The Modern style (known also under names of "Art Nouveau", "JuANodstil", "Art and Craft", "Liberty"), is a theorist style born in years 1885-1890 in workshops of carpenters as Majorelle or Vallin. Years going from the end of the second French Empire until first world war have seen born the art of Van Gogh and Gauguin who were misunderstood to their period. Universal exhibitions to the XIXth century succeed and favor flow of ideas. It is as well as an international style appears under the "Art Nouveau" name; This term were devoted by the Paris 1900 universal exhibition. To the dawn of the XXth century, with the industrial advent of that era, the style of life change and progress is fast. International Fairs of the end of the last century promotes the exchanges, thus an international style appears under the name of Art nouveau, Modern style, JuANodstil, Art and Craft, Liberty. The main topics of the Modern Style are from vegetable inspiration. By predilection this period will use forms in "knock of whip", the sinuous shapes of the lianas, the bind-weed or the water lilies. These undulating movement do a reverence to the flexibility and suppleness of female hair. One distinguishes two treatments of this vegetable proliferation. To one side these sinuous lines are insulated and drawn as in filigree, leaving great parts of the background visible. Another treatment to the opposite although also using these same sinuous forms will fill up all surface of the tapestry in an inextricable inter-mix. Colors alone making the part of the contrast and thus facilitating the reading of the pattern. In France it is to Nancy that grown this brilliant breath that brought up all the modern decoration. According to Emile Gallé, glass-maker master and decorator of furniture: "the example has to be taken on the vivid to the museum of the nature." . . . . "Each artist has to see in all spring as its clean resurrection." Art Deco 0581 Art Nouveau:Tapestry constituted by floral composition of tulips and lily in one graduation of the clear pink, vivid pink and yellow. The foliage rushes across the flowers and gives thus to the composition a bushy aspect. Because the surface is entirely covered with, this tapestry is agreeable to realize. 0622H Nouveau:Elegant composition composed with geometrical central motive that rushes and stretches on the surface. Around has been grafted one foliage and berries that resume the blue, green and pink tones. 0619C Art Deco: A superb branch of thistle to colors borrowed to one gradation of green yellow. Flowers are colored in pink with the sheens of tender purple. The totality forms a bush circle adapted to the form's seat. 0004 Modern Style 0168 Art Nouveau. A flower drawn from an architectural reason. The inspiration and the recovery of various arts between each one become all its extensive at that time. 0072 Modern Style.her the artist uses the lily as central motive. He was stretching it as a fan. A ribbon draws a form in shell too. Four Dahlias in perspective frame this motive. The foliage underlines the movement. A very characteristic Tapestry. ¹ Needlepoint Tapestry kits contain the hand painted canvas in full color from Annie Bouquet 's Studio (NB: any color combination may be ordered, according to decoration. ), yarns, two plated Gold needles, and instructions. The 100% cotton canvas is a double weave antique or white Monofil. The yarn is 100% pure wool "Medicis" from DMC France and some others dyed specificaly for us to Aubusson.